Ethics, Politics & Society is a new open access academic journal with double blind peer review dedicated to the publication of high level contributions in the fields of Political Philosophy and Theory, as well as Normative and Applied Ethics. Although it is open to all themes and approaches in these areas of knowledge, the journal focuses on issues related to theories of justice, democracy and recognition, as well as on ethical issues connected to scientific and technological development and their social and environmental impacts. Ethics, Politics & Society accepts the submission of originals both with a direct contemporary approach, or using the History of Moral and Political Philosophy to shed light on relevant problems in our time. This first issue of Ethics, Politics & Society includes an open section and two closed sections that have been nevertheless subject to the same standards of peer-review. The first open section is composed with original articles submitted by Douglas Giles, Lars Lindblom and Matthew McLennan. The section devoted to the 8th Braga Meetings on Ethics and Political Philosophy opens with the keynote lecture on “The Democratic Boundary Problem Reconsidered” delivered in Braga by Gustaf Arrhenius. This outstanding contribution is followed by a dossier of selected papers presented at the Meetings by Ashley Lane, Josh T. U. Cohen, Deven Burks, Daniel Guillery, Stephen McLeod, and Damiano Simoncelli. This section has been guest edited by Alexandra Abranches and Eze Paez. The third section consists of a Symposium on Friedrich Hayek and Karl Polanyi. This timely and provocative book discussion that combines readings of The Road to Serfdom and The Great Transformation has been guest edited by António Baptista and Pedro Teixeira, with contributions by António Baião, José Colen and Pedro Moreira, Filipe Nobre Faria, Patrícia Fernandes, Bru Lain, and João Rodrigues. Ethics, Politics & Society encourages prospective authors to submit their manuscripts in English, Portuguese or Spanish through the journal website, together with the statement that the submitted piece has not been published before and elsewhere. All the papers submitted to Ethics, Politics & Society are subject to the evaluation of at least two reviewers in the corresponding scientific domain. Papers are sent anonymously to blind referees, who are asked to write a review according to the evaluation form adopted by the journal, which includes the following aspects: adequacy to the journal publication standards; adequacy of the paper subject to the scope of the journal; substantive relevance; originality; relevance of the critical methodology; clarity of presentation; arguments and relationship between initial hypotheses and final results. With the appearance of Ethics, Politics & Society, its editors believe that a clear and urgent lacuna is filled in for an international journal that works as a high-level global forum imprinted with the perspective of Southern Europe. ARE MORAL FUNCTIONALISM’S MORAL A PRIORI COMMITMENTS REALLY A PRIORI? HOBBES: A VOLUNTARIST ABOUT THE PERMISSIBILITY OF STATE ENFORCEMENT? 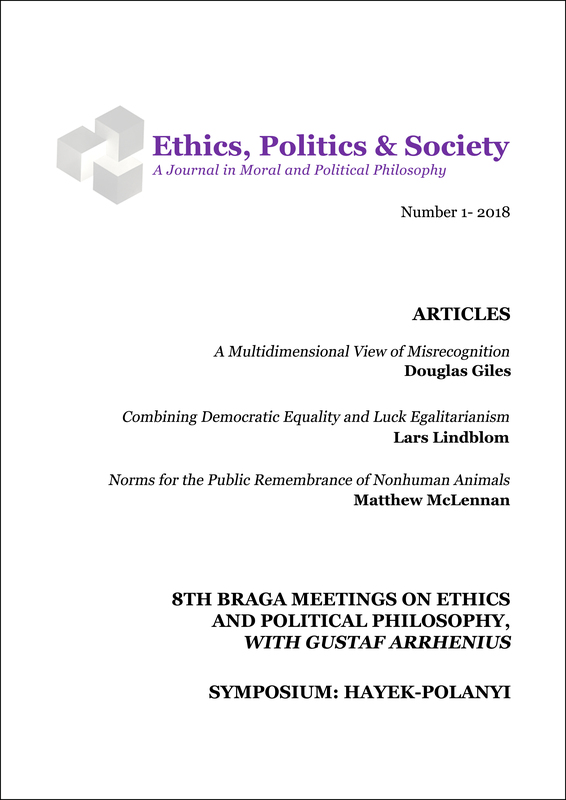 Ethics, Politics & Society is an academic journal with peer review dedicated to the publication of high level contributions in the fields of Political Philosophy and Theory, as well as Normative and Applied Ethics. Although it is open to all themes and approaches in these areas of knowledge, the journal focuses on issues related to theories of justice, democracy and recognition, as well as on ethical issues connected to scientific and technological development and their social and environmental impacts. Ethics, Politics & Society accepts the submission of originals in English, Portuguese, and Spanish both with a direct contemporary approach, or using the history of Moral and Political Philosophy to shed light on relevant problems in our time.